Newburyport is very unusual due to its’ Wall to Wall Federalist Architecture which for the most part was not heavily renovated until the 1970’s. This was very advantageous, because in the 70’s there came to be a spirit of restoration that valued the original details. The possibility of losing these details was very real. Had the area become more interesting in previous decades when Urban Renewal was a catch phrase this history might have gone by the wayside. As it was, I think because the major Highway North sort of bypassed it, it was laid fallow. John Grosvenor and Cheryl Hacket of NCArchitects are renovating a Federalist piece of Architecture right now in Newport for themselves to live in. John is an Architect and Cheryl is the Architectural Historian for NC Architects and writes a Blog, Homes of the Brave with the ongoing challenges and bright spots of restoring this piece of property. The Federalist Period was from 1780 to 1820. Well before the Invention of Electricity. 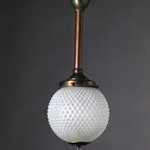 So lighting a Domicile like this with Period Lighting is practically impossible. First there is not very much from the period available. And what is available are minimal wax candle fixtures. 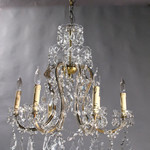 We did some business with Cheryl and John and supplied some lighting for their project.You can actually see what we sold them in Cheryl’s Blog. 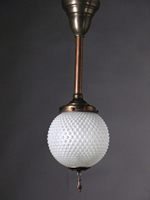 Usually when someone comes to me with a Federalist or a Greek Revival (c 1840) from the period I direct them to the Colonial Revival and Neo-Classical Revival fixtures in our Inventory which are all originally electric and from the early 20th Century. As I mentioned in a previous Blog, the Revival in Architecture and Furniture with accessories has been quite persistent in our country since Colonial times. 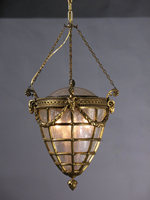 There is much to be chosen from Antique Lighting Fixtures from the Early 20th Century that were created for buildings built after the period that are Federalist , Greek Revival and Colonial Revival in Design. 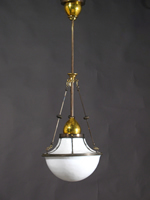 We actually sold a very interesting fixture 788L-G,Cast Bronze Lantern w/Rams Heads to a couple doing a renovation of a Colonial Revival in Belmont, MA. I think it ended up working very well as a Lantern Hanging between two floors. 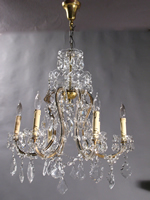 The use of Colonial Revival and and Classical Revival Lighting from the Early 20th Century is really an incredible advantage for someone who wants to use Antique Lighting and Stay true to the Architecture. John and Cheryl’s future home has been renovated over the years and they have put an addition on as well. There are Arts and Crafts details that exist in the structure. Many buildings are like this that have become hybridized through the years through additions and other types of renovations. 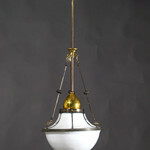 This makes the use of lighting from the early 20th Century doubly important in the sense that these fixtures often have to work with each other.